The Auglaize hydroelectric plant is located on the Auglaize River, just south of Defiance, Ohio. The original dam was built in 1912 by the Auglaize Power Company at a cost of $500,000. It was shut down in 1962 and the generating equipment was relocated. The Auglaize plant sat vacant until the 1980s when Power Dam Corporation bought it. 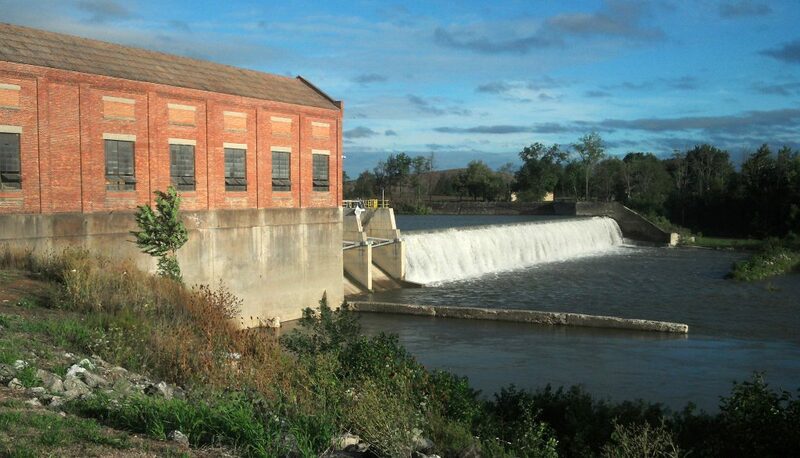 In 1994, Power Dam approached the city about purchasing the plant and in 1996, after extensive investigation and negotiation, Bryan purchased the plant for $1.12 million. The Auglaize plant has six generating units differing in size and design. The two large units generate 1,100 kW. The smaller turbine, used for minimum flows, generates 140 kW. Three other units at the plant generate 800 kW each, for a full capacity output of 4,740 kW. The design of the units and the engineering allows BMU to take advantage of varying water flows and utilize the water efficiently. The smallest unit can generate during low flows and the larger units can generate during high tail waters. In 2006, the Auglaize Hydroelectric Plant was able to generate a record 13,637,035 kilowatt hours or enough to supply 1,337 average homes in the city of Bryan for an entire year. The Auglaize plant adds more capacity to Bryan Municipal Utilities existing generation and gives BMU the opportunity to sell power in the market. BMU also has contracts in place that sell generation capacity to other municipal utilities that need to protect themselves from the high cost of peak power on hot summer days. The Auglaize is one more power source BMU can call on to back up those contracts. This lessens the risk involved to Bryan and makes those contracts easier to enter into. Hydroelectric power is an emission-free energy source. By replacing power purchased from fossil fuel burning power plants, the Auglaize plant avoids air emissions of tons of carbon dioxide, sulfur dioxide and nitrous oxide pollutants every year. Those pollutants contribute to acid rain, ozone depletion, and global warming as well as contaminate the air we breathe. As a publicly owned utility, we can make choices regarding the sources of our electric power. Consideration of our environment must be an important part of the decision-making. The Auglaize dam provides about 4% of Bryan’s power needs. Our part ownership of the Belleville Hydro Dam on the Ohio River provides another 4%, and we purchase 3% of our load from New York Power Authority’s Niagara Falls Dam. Thus, about 11% of Bryan’s load is hydroelectric power–power that is clean, efficient and renewable. The Auglaize hydroelectric plant is a long-term commitment to a portion of our power supply that will be advantageous to the citizens of Bryan for years to come. It is a commitment that will return income, steady power costs and clean air. Bryan can proudly say we are doing our part to protect the environment, and we can save money while we do it. In 2013, BMU celebrated the centennial of the Auglaize Hydroelectric Plant. As part of that celebration, BMU produced a 30-minute video commemorating the plant’s 101-year history. The video documentary follows the history of the Auglaize plant from its groundbreaking in 1911 to 2013. Old photos, maps, and interviews tell the story of the plant’s construction, four changes in ownership and refurbishment by BMU. Sign up to receive news alerts related to the Auglaize Hydro Dam. Do you live near the Auglaize Dam?